So, who likes Game of Thrones? Apparently many people do, but now not so much anymore, as all of a sudden, singer and songwriter Ed Sheeran mysteriously appeared on HBO’s Game of Thrones in the last episode, complete with singing and all. This has irked many loyal fans of the favourite TV drama, since they couldn’t quite believe their eyes either, seemingly not content with sixteen spots in the top twenty in the UK music charts, he’s gone one better and appeared on Game Of Thrones as well. Let’s take a look, shall we? How do you rate his song in here? Quite understandably fans of the show didn’t take too well to seeing Ed Sheeran on the program, as realistically, it’ll be difficult to picture him as anything but the ginger singer at this point, and never has he ever been an actor, apart from perhaps in his music videos and on stage, thus singing and playing his music. So, why does it come as such a big surprise for Ed Sheeran that fans of Game Of Thrones didn’t like seeing him on the show? Surely, he should realise that perhaps he isn’t cut out to be an actor, when his only skills are that of a musician. Whatever happened to sticking to your remit in these liberal times, where everyone seemingly gets a participation trophy and such? 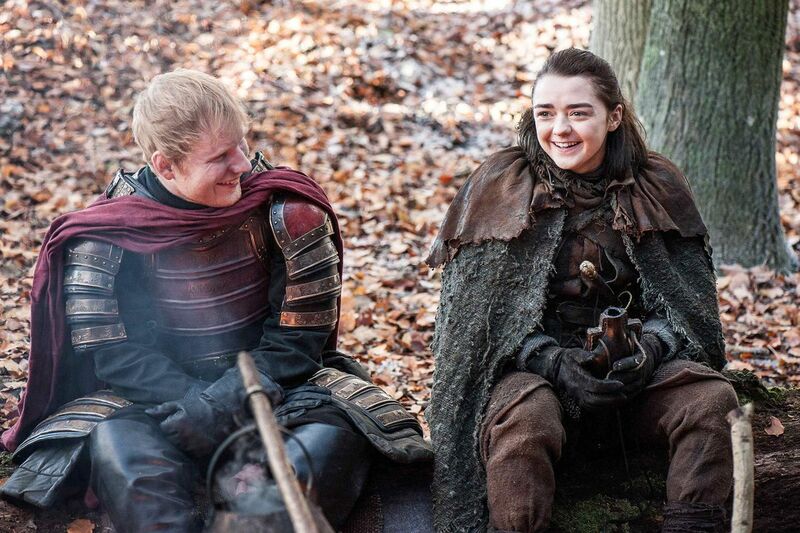 Even if they’re not good at what they do… Fame and money would have it that Ed Sheehan now appears in Game of Thrones. Now, we haven’t had the chance of engaging in the series as a whole, but the whole scene did look very funny to us, bordering on the lame. So, who is to blame? The directors, the producers, HBO, or is it Ed Sheeran’s fault? Anyway, as a result of some major backlash on Twitter from these Game of Thrones fans, Ed Sheeran sensationally quit Twitter, due to the comments and backlash on the social media platform who lambasted his cringeworthy appearance. Uh-Oh! Was he really that bad in the scene? Or is it more about “authenticity” and preserving the sanctity of the popular HBO show? We think that it’s a bit of both, and this surely would’ve gone down better on a sitcom where Ed played himself or something along those lines. Seemingly, stars and celebrities want to cross-over a lot from film to music and from music to film, but sometimes it’s better that they just let it be and don’t even bother. Despite all of this bad press, Season 7 of Game of Thrones has already seen a 50% increase in viewers as reported by the Independent. Does this mean that Ed Sheeran may have further scenes in the season? Or was it just a one-off cameo appearance? If he does have more scenes, will they be cut from their respective episodes before they air, or will we see him singing more hymns and nursery rhymes on Game of Thrones? We cannot confirm this at this stage, and we welcome comments down below from the die-hard Game Of Thrones fans to state their opinion on the matter. Don’t be shy, fire away! It’ll be fun to see if Ed Sheeran ever returns to Twitter after this whole mess clears up, or if the famous ginger “songster” will be invited back to star in more episodes.